Did you know that the upper one-third of your face plays a key role in communicating your mood? A smooth, open appearance to your eyes and forehead tells others you are feeling refreshed, happy, and alert. On the other hand, a heavy, furrowed brow cues others to perceive you as tired, angry, or overly concerned, even if this couldn’t be further from the truth. A brow lift repositions sagging brow tissues, smoothing deep furrows and restoring a more naturally refreshed appearance to the forehead. If you (or others) feel like you look angry, sad, or tired all the time, the problem may be an aging brow. The aging process can cause the skin, muscle, and connective tissue on the forehead to droop, resulting in a brow that looks angry, frustrated, or tired. When performed by a skilled plastic surgeon, brow lift surgery can help you take several years off your appearance, look more approachable and happy, and even more importantly, feel more confident in your appearance. A plastic surgeon’s experience, skill and aesthetic sensibility make a difference in your results. To Dr. Conway, any cosmetic enhancement should be undetectable by others as surgery. Naturally appealing results require techniques that achieve the desired improvements while preserving an individual’s natural facial contours. Before he became a board certified plastic surgeon, Dr. Conway trained and worked as a medical illustrator. This specialty required him to develop a thorough understanding of anatomy as well as a keen eye for proportion, detail, and symmetry. Combining artistic talent and surgical skill, Dr. Conway enhances the unique features already present in a patient’s facial contours to produce beautiful, natural-looking brow lift results. 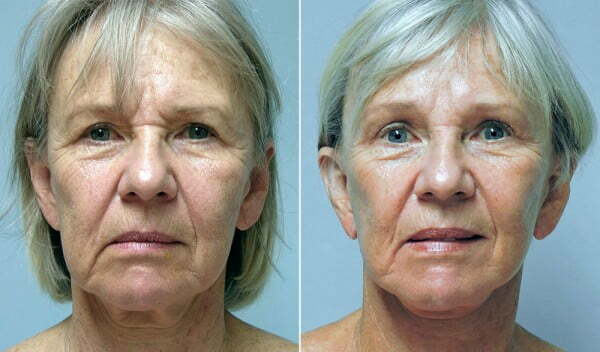 Facelift: eliminates sagging skin and jowling in the mid to lower face (cheeks and neck). While many patients have a brow lift at the same time as an eyelid lift and/or a facelift, a brow lift is a unique procedure that can be performed on its own for patients whose concerns are limited to the forehead and can be addressed through brow lift surgery alone. Patients with very mild skin laxity in the forehead who are mainly concerned about smoothing brow furrows or frown lines can often address their concerns non-surgically with Botox or Dysport. Both injectables relax the muscles that contribute to these wrinkles to smooth their appearance. Dr. Conway may perform a brow lift with one of many techniques, ranging from minimal incision to removal of skin or scalp in a location designed to hide scars. Which brow lift procedure is best for you depends on your anatomy, your goals, and the nature and extent of sagging that needs to be addressed. At your consultation, Dr. Conway will take the time to explain your options thoroughly, so that you can make an informed decision about your surgery. Dr. Conway performs brow lift surgery as an outpatient procedure in our private, on-site surgery suite, so you will be able to go home several hours after your procedure to continue your recovery. How you can expect to feel and when you can expect to return to your normal activities depends on the extent of your brow lift procedure. Light activity can usually be resumed within the first week, although it is important not to lift or strain for at least 2 weeks after surgery to avoid stressing your incision sites. Many patients return to work several days after having an endoscopic brow lift as a single procedure; if you are having a brow lift as part of a facelift, you may need more time before you feel ready to go out in public. Most patients find pain is minimal after a brow lift; discomfort and a “tight” feeling around the hairline are most pronounced during the first week after surgery. Bruising and swelling are common; these effects typically subside within 2 to 3 weeks following your procedure. Will brow lift results last? Dr. Conway explains it to his patients like this: having a brow lift is similar to rewinding the clock on the aging process. The brow tissues are restored to a more natural position that they held when you were a few years younger. The aging process will continue, but your results will age naturally with you. They will not age faster or slower than the rest of your face. You can help keep your results looking their best by adopting a high quality skincare routine, not smoking, and wearing sunscreen daily. Are you ready to learn more about brow lift surgery in Asheville? Please contact us today to get started by scheduling a personal consultation.